BlackRock is winding down its Global Ascent Fund, a global macro hedge fund that once contained $4.6 billion in assets, according to Bloomberg’s Sabrina Willmer. “We believe that redeeming the Global Ascent Fund was the right thing to do for our clients, given the headwinds that macro funds have faced,” a BlackRock spokeswoman told Business Insider. The winding down of the Ascent fund is the second high-profile hedge fund closing in 24 hours. The Wall Street Journal reported Tuesday that Achievement Asset Management, a Chicago-based hedge fund, was closing. And those are just two examples. Quite a few other prominent hedge funds have shut down recently, and many are wondering if this is just the beginning of a major “bloodbath” on Wall Street. A number of smaller energy companies have already gone out of business, and several of the big players are teetering on the brink. If the price of oil does not rebound significantly very soon, it is just a matter of time before the dominoes begin to fall. Retail sales this holiday season are setting up to be a disaster. Already most retailers are advertising “pre-Black Friday” sales events. Remember when holiday shopping didn’t begin, period, until the day after Thanksgiving? Now retailers are going to cannibalize each other with massive discounting before Thanksgiving. Anybody notice over the weekend that BMW is now offering $6500 price rebates? The collapsing economy is affecting everyone, across all income demographics. But stocks went up 247 points on Wednesday so everything must be great, right? The stock market has never been a good barometer for the overall economy, and this is especially true these days. In 2008, stocks didn’t crash until well after the U.S. economy as a whole started crashing, and the same thing is apparently happening this time around as well. Big corporations like to do this for a couple of reasons. Number one, it pushes the price of the stock higher, and current investors appreciate that. Number two, corporate executives are usually in favor of conducting stock buybacks because it increases the value of their stock options and their own stock holdings. But now corporate profits are falling and it is becoming tougher for big corporations to borrow money. So look for stock buybacks to start to decline significantly. Even though it is taking a bit longer than many would have anticipated, the truth is that we are right on track for a massive financial collapse. 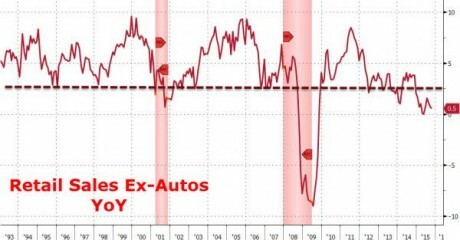 All of the indicators that I watch are flashing red, and even though things are moving slowly, they are definitely moving in the same direction that we saw in 2008. But just like in 2008, there will be people that mock the warnings up until the day when it becomes completely and utterly apparent that the mockers were dead wrong.